I’m a person that needs answers, so when I realized I couldn’t pinpoint why, I did some research for help…….. Initially, I was partially aware that I scrolled through my phone, when I was bored, but I didn’t think I “had a problem”…I was just bored…..2 weeks ago, I admitted that I was bored at work and procrastinating…. I was looking for an answer as to why I always pick up my phone….. Blaming a boring job was an easy thing to do. I was just procrastinating, I wrote…… NO! I was denying that I have a problem. This is addiction at its finest, denial! Rather than take responsibility that I have an addiction to my phone, I blamed it on an outside factor of my life and didn’t accept responsibility for my own actions. I see, now, how deep screen addiction runs in me and I have been battling myself ever since. Seriously… I need to remind myself and restrain myself from picking up my phone. I thought it would take a week or so to “adjust” but not only has it taken longer, but it has also been much harder than that. I want to share with you some interesting things that I learned when researching using technology usage. First, screen addiction is an actual behavioral addiction. Second, a majority of tech executives do not permit their own children to use tech devices…..
Third, it is harming the future of this society at its roots; children. Lastly, it is harming everyone physically, mentally and emotionally. …………….No sarcasm or puns here. It is actually really scary. I didn’t even know that I had an issue, and now I am struggling to control my urges to check my phone. I’m not “that guy” who takes my phone out at dinner or checks my phone when I’m with friends. I consider myself pretty laid back with my droid, but now that I am not going on social media, I am seeing how much I was checking in – and I can’t stop the impulse to want to scroll through my phone……. 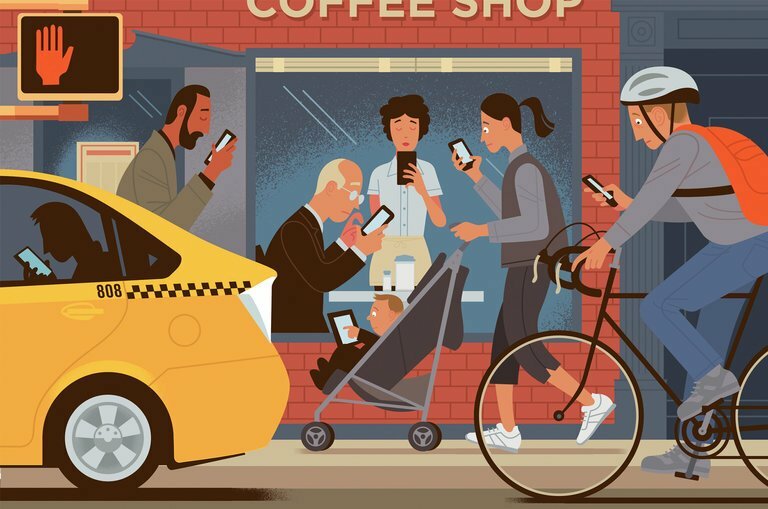 According to the New York Times –1-, Americans check their cell phones 150 times a day. I never really thought about this. Every day when I pick my daughters up from school- I am sitting in my car for 5-10 minutes waiting for them. Lately I have been looking out to see what other adults are doing while waiting for the children they’re picking up. Almost 100% of them, every day, are looking down at their phone…….. I guess before this, I would have been doing that too. According to the same article, “The only difference between digital addiction and other addictions is that this is a socially condoned behavior”. I couldn’t agree more. Did you know: Tech execs don’t allow their children to use i-Phones, iPads? My take from this article: Money is the root of all evil. In my opinion, from reading this article, tech executives, at the very least, are aware of the dangers of the technology they are selling to the world. The more they sell, the richer they get. They know exactly how to get to consumers and are studying the reactions in their brains to sell them more, so most people don’t even realize that they are being manipulated. There is a small part budding inside me that wants to start a no- tablet/smart phone revolution. What is going to happen to society, to the world??? My thought- how can parents prevent this addiction if it is something they aren’t even aware of, myself included, up until this week. Everyone knows the general courtesies of using technology- just like the age-old “don’t sit too close to the tv”… but this is more serious than the concerns of the old millennium. I asked my 11 year old daughter a question a couple months ago and she responded, “Let me ask my best friend, google”….. I knew she was joking about google being her best friend but she wasn’t joking that she was going to check the internet and I got a very strange chill up my spine when she said it……. This was all well before my great awakening to the dangers that I am now aware of, but it is an example that this issue with technology and kids is in your own home. My Dad is a Sr. Tech expert and says that almost all the guys who work under him would be useless if the internet went down. When they are asked to do something, they don’t know how…. They google it….. So what does happen if/when the internet goes down??? If young adults and children use google as their back pocket encyclopedia….. But aren’t actually learning and retaining things…..
DANGER- Technology may cause damage to you physically, mentally and emotionally. We all know that phones and tablets have the potential to put a wedge in any relationship; phones at the dinner table or brought out on a date, playing with a tablet at home rather than spend quality time with your loved ones……. These are all “known” by everyone. Think about the damage it can really have on you emotionally, mentally and physically. You never have to think for yourself. You never have to entertain yourself. You aren’t partaking in hobbies or physical activities and sometimes opting out of social activities because…… TA-DA, you’ve unintentionally become addicted to your device…..
Maybe I was just completely oblivious, but so much of what I found in my research was very shocking to me. Now I feel like I am in some sort of technology purgatory and my eyes are being opened, for the first time, to the dangers of something I always thought of as efficiency. Technology is still efficient, but the idea of “as long as you are mindful of your usage”, is not going to solve the pending harms. No matter how mindful you are- the programs being created are being created to purposely manipulate your brain so you become addicted. Example: You can be aware of how many cigarettes you have, but the fact is- they are still addicting and every time you have another, you are becoming more hooked. Technology execs do not let their children use tablets and smart phones…. ….. Let that sink in……. I’m halfway through my 40 days with no social media and I am becoming very aware of topics that are very concerning to our health and to our children’s futures. Have you heard the song, “Another Brick in the Wall, Part 2”, by Pink Floyd? If you have never watched the video to this song, I highly recommend you do so-You Tube 5-. It is a great representation of where I am going here. People are so hooked to their devices that it is as if we are almost becoming robots. In the video the kids are formed into a line and they are forced to march in sync, eventually ending up in face-less masks that lead to them falling into a machine and coming out as ground meat…… kind of a dark analogy, apologies for that, but there is some scary truth here. When Pink Floyd wrote this song- technology was nowhere near where it is now, but it’s eerie just how much this song relates to the technology addiction that is rising and what people and society are becoming- faceless masks being turned into processed ground meat. Who knew a break from social media would be such a technology revelation to me?